These mounts can be glued or taped to your plane. The image on the left shows the firewall mount plate installed for firewall mounting motors. The image on the right shows a blue wonder installed, clamped on the 8mm bearing tube. All mounts come with the slot modified standard unless otherwise requested. This modification allows for easy installation and removal of the motor in the event of a ground strike. 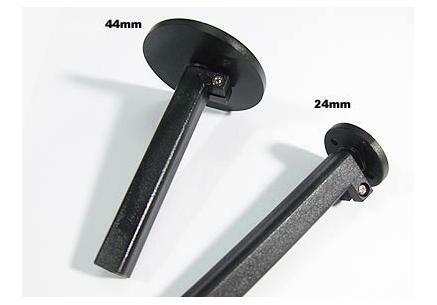 The square part of the mount is just under 10mm (.392in.) so it works great on 9mm EPP foam, and 1/4 in foam as well. The 8mm hole goes all the way through both ends so if you wish you could cut the mount in half and use the tube mount for one plane and the firewall mount on another, thus getting 2 mounts for the price of one!